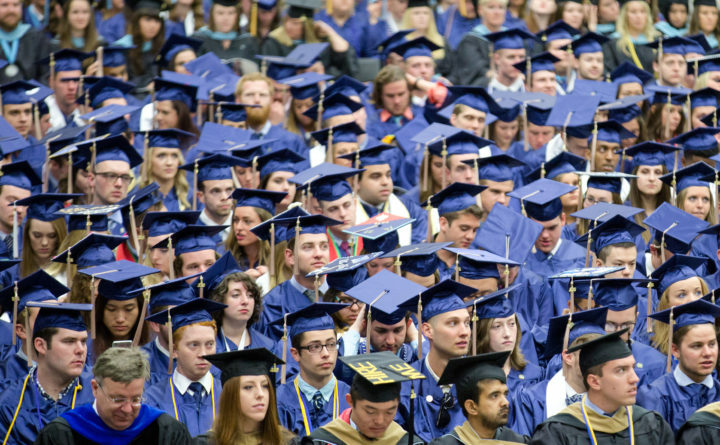 File photo of UMaine's 2016 business, education and human development, liberal arts and sciences and lifelong learning seniors graduation, held at the Alfond Arena. The new leader of Maine’s largest and smallest public universities will be selected Monday, but it will likely be a while before that person’s identity becomes public. University of Maine System Chancellor James Page is expected to make his recommendation for who should serve as the University of Maine’s next president — a position that also involves oversight of the system’s Machias campus — during an executive session at the close of Monday’s board of trustees meeting at the University of Southern Maine. The board will then decide whether to have Page work with the selected candidate to iron out a contract. The pick won’t be unveiled until after a contract is signed, then the university will schedule a campus event to introduce the next president. — Sally Reis served as vice provost for academic affairs at the University of Connecticut from 2011 to 2017. She was named a distinguished professor there, and she has 40 years of teaching experience ranging from middle school to college. She was head of the educational psychology program at UConn from 2000 to 2006, and has a doctorate in educational psychology from the UConn. One major area of focus in her research has been how to identify and support gifted students. — Amit Chakma has worked as president and vice chancellor at the University of Western Ontario in London, Ontario, Canada, since 2009. He also is a chemical engineering professor at the university. Prior to that role, he was academic vice president and provost at the University of Waterloo in Ontario, Canada. He earned a doctorate in chemical engineering from the University of British Columbia. In 2015, Chakma faced heavy criticism after his $967,000 in salary and benefits at Western came to light, a result of working through a scheduled sabbatical. He soon apologized and voluntarily returned half his salary. He later announced he wouldn’t seek a third term as president at Western. His current term ends in June 2019. — Joan Ferrini-Mundy is chief operating officer of the National Science Foundation, an organization in which she’s held leadership roles since 2007. Prior to her work with the foundation, she held administrative roles at Michigan State University and the University of New Hampshire. She has a doctorate in mathematics education from the University of New Hampshire. — Nancy Targett is provost at the University of New Hampshire, a role she’s held since 2016. Targett earned a doctorate in oceanography from UMaine. She withdrew her candidacy after being named a finalist, according to the university’s website. Each finalist visited the Orono and Machias campuses in late February or early March and pitched themselves to students and faculty on both campuses. Faculty, staff and students had the opportunity to complete surveys to provide feedback to the chancellor and selection committee. System officials have been searching for a replacement for outgoing President Susan Hunter, who is set to retire this summer. Hunter was the first woman to serve in the role. Whoever fills her shoes also takes on her extra responsibility, leading not only the system’s flagship campus in Orono, but also the University of Maine at Machias. The Machias campus struggled for several years from budget deficits, shrinking enrollments and cuts aimed at keeping the institution afloat. The University of Maine has since taken UMM under its wing, accepting the bulk of administrative responsibility for the smaller campus.